Josh Safdie’s French New Wave-inflected debut feature The Pleasure of Being Robbed (2008) centers on a sociopathic protagonist named Eléonore (Eleonore Hendricks) and played at the Directors’ Fortnight at Cannes. Eléonore robs people – purses, credit cards, cars, as well as pets from children – for the sheer fun of it. I’m not sure that the small coterie of New York movie reviewers who compared Safdie to Bresson, Godard, Tati, Miranda July and John Cassavetes did the young American indie filmmaker much of a favor, but Josh and Benny Safdie’s new film Daddy Longlegs, aka Go Get Some Rosemary (2010), which premiered at Cannes and played at the Sundance Film Festival in January, is another matter altogether. Many of the characters from The Pleasure of Being Robbed are back again, but Daddy Longlegs, a portrait of a harried and divorced father named Lenny (Ronald Bronstein), represents a leap forward in terms of filmmaking and proves that the Safdie brothers are indeed major talents. Much of the strength of the new film results from the complexity of its characterization. Although he’s not an actor – at least not until now – Bronstein brings intensity to Lenny, who appears to be overwhelmed by everyday life in New York City. Lenny, who works as a film projectionist, is perpetually someplace else – where else, we’re not exactly sure. His attention span appears momentary – like someone who suffers from ADD, which is mirrored by the shaky, hand-held camera work by Brett Jutkiewicz and Josh Safdie that captures the fleeting details of the action. Lenny at least tries to deal with his two mop-haired kids, Sage (Sage Ranaldo) and Frey (Frey Ranaldo) – the real-life sons of Sonic Youth’s Lee Ranaldo – even if he’s woefully inadequate to the task. There’s a strong autobiographical undercurrent that flows through Daddy Longlegs, which is a bittersweet portrait of Josh and Benny Safdie’s own father and their conflicted feelings for him. The film contains the dedication: “For our father, for fun as a responsibility, for the middle perspective, a lost past, lights on during the day time, lost love but still something there, excuses, the fridge full of games, small apartments & our mother.” It’s interesting to note, even in the dedication, how the dad still manages to capture the fantasy and imagination of the children by his absence and irresponsible behavior, much like the father in So Yong Kim’s remarkable In Between Days (2006). The two young filmmakers attempt to empathize with their own father, who found himself at their age with two young children. Single moms may have little sympathy for the character of Lenny – and rightly so – but he’s not really a bad person, but someone who fails miserably to adapt to the role of being a father when he gets to have the kids for a two-week period. Lenny is a deadbeat dad, but saying that sounds much too harsh. If someone referred to Lenny by such a label, he would no doubt be appalled, even though his parental behavior would most certainly not only get him in trouble with social services, but locked up. Lenny is as much of a mess as Roger Greenberg in Noah Baumbach’s latest film, Greenberg (2010), but the difference is that Lenny doesn’t psychoanalyze himself or try to rationalize his behavior, which, in a sense, might be his saving grace. The Safdie brothers manage to capture the sheer chaos of what it’s like to have young children within the confines of a cramped apartment in an urban environment. I confess I felt overwhelmed by the way Sage and Frey seemed to bounce off the walls in the scene of Lenny trying to play racquetball with them in the gym. Lenny doesn’t try to show them how to play, but instead ridicules them for missing the ball, indicating that he’s clueless when it comes to what’s expected of a father. Of course, it’s hard to concentrate on such things when there’s some naked flasher lurking in the locker room. The film begins with Lenny dropping a hot dog as he attempts to scale a chain-link fence in the park. He at least has a sense of humor about himself, as his laughter continues over the hand-written opening credits. When Lenny picks up Sage and Frey at school, he immediately gets into conflict with the school principal, Mr. Puccio, who complains that Frey, the younger of the two boys, assaulted his math teacher. Lenny responds, “Okay, the kid is the size of a two-year-old, all right? So I don’t know what kind of ruckus he’d be causing in your classroom.” When Lenny curses, and the principal objects, Lenny insists with self-righteous indignation, “Do not reprimand me in front of my children! Do not reprimand me in front of my own kids, all right?” Lenny is full of ultimatums. Lenny has a girlfriend named Leni (Eleonore Hendricks). When Leni comes over, she finds him and the kids wrestling on the couch together. Leni comes across initially as a sympathetic character, as she pretends that a live salamander is a prize in a cereal box, much to everyone’s delight. But within minutes, she has to call Lenny into the bathroom to complain about the way he’s acting. It’s no wonder that Lenny picks up another woman named Roberta (Dakota Goldhor) in a bar when he slips out to have a beer with a male friend once the kids are asleep. The next morning, after Roberta indicates that she’s heading upstate for the weekend, Lenny manages to tag along. Her boyfriend, Aren (Aren Topdijian) is flustered that she’s invited a stranger, but even more so when Lenny brings along his kids. Aren finally blows his top when Lenny and the kids sing a mangled rendition of the national anthem on the journey upstate. Life can be precarious in a place like New York City. 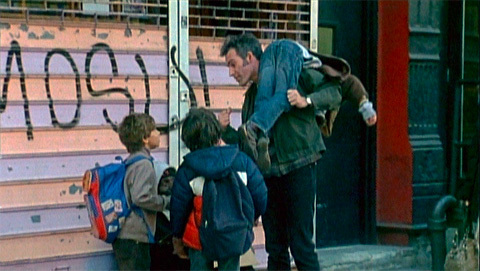 While carrying ice cream cones for the kids, Lenny runs into an aggressive street person (an utterly convincing and scary cameo by film director Abel Ferrara), who tries to sell him a bogus CD. Lenny insists he has no money, but when he offers the guy a piece of bread, the street hustler flashes a gun and takes his money. What’s interesting is how quickly Lenny shifts his attention away from this seemingly traumatic event. Once Lenny returns empty-handed, it’s as if it never happened to him. The same is true of his phone arguments with his wife, Paige (played by artist Leah Singer, Sage and Frey’s real mom), which the kids watch with grave concern (Sage has big eyes and bears resemblance to the Italian actress Giulietta Masina). When Lenny abruptly hangs up on her, he turns to the kids and says, “You see that, guys? You see that? That was awesome, huh?” He laughs, rips open his shirt, playfully jumps on the kids and starts to wrestle with them. The wrestling match is interrupted by the surprise visit of a crazy friend named Salvie (Salvatone Sansone), who plays a questionable game of stepping on the kids’ stomachs. At work, Lenny mixes up his schedule with that of a co-worker, which causes him to be late to pick up the kids at school (where one of the teachers sports a prominent black eye). Mr. Puccio has called Paige rather than him, which riles up Lenny once again. As Paige holds her kids tightly, Lenny insists, “Hello? This is my screw-up. I’m entitled to screw up in my two weeks. You can screw up for the rest of the year.” Kids in tow, Lenny rushes back to the projection booth, just in time for the reel change-over. Lenny attempts to instruct Sage on the nuances of film projection, but Sage fails to push the button at the appropriate moment. The kids spend much of their time drawing comics in the hallway. One of my favorite scenes in the film is when Sage acts out the panels of the comic (complete with sounds effects and laughter), in which Lenny’s boss asks him to get a glass of water, and he pees in a cup and gives it to him. The two kids make nearly a thousand copies of their comic on the film theater’s copier. In a later scene that evokes Jean Vigo’s 1933 classic Zéro de conduite (Zero for Conduct), the wind blows all the sheets in the air, as Lenny, Leni, and the kids chase after them on the street. Lenny bribes a neighbor (Jake Braff) to watch the kids with a rare comic, so that he and Leni can go out to a Chinese restaurant for the evening. When they miss the train while returning home, Leni suggests walking on the tracks to the next subway stop. Lenny at least has the gumption to tell her, “With all due respect, that’s a really stupid idea.” Of course, Leni impulsively does it anyway. The scene is extremely disconcerting, especially because Lenny is so preoccupied with his own issues, and Leni’s too self-indulgent to sympathize with his plight. The worried look on Lenny’s face and the suspenseful ride to the next stop while Leni walks through the train tunnel turns out to be one of the film’s most powerful moments. Daddy Longlegs will play at the Wisconsin Film Festival in mid-April. It’s one of the most impressive indie films I’ve seen so far this year, so if any tickets remain, you might want to snag them.